Demolition Pro USA is eagerly enthusiastic to provide safe demolition services to our clients by complying with the needs and demand. Alongside with residential and commercial sector, we are also working closely with the pool demolition. Pool removal involves drilling holes in the bottom, demolishing the top, draining the pool, and filling the pool with the rubble and additional dirt soil. However, above ground pool removal is less complicated, involving just draining the pool, tearing it down, and hauling it away. 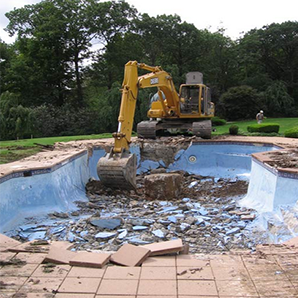 The safer pool demolition is also one of our core services, which is completed as per the international standards. The safety is effectively implied to provide the highest standard of services to our valued clients. We also believe in finding environmentally sound ways to help achieve our client’s goals. ​ With each project, we also endeavor to minimize waste by maintaining a higher volume of recycling. Therefore, Demolition Pro USA is working in the market with its complete potential for serving the commercial clients in terms of demolition.